Uses radio frequency (RF) waves to read and write data to and from a tag and to perform identification functions. 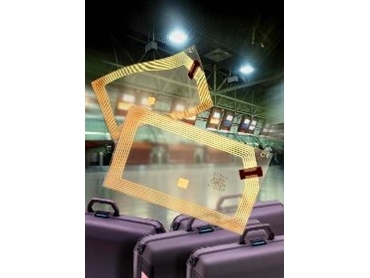 OMRON Electronics is proud to announce the release of their V690 series RFID tagging system. This system uses radio frequency (RF) waves to read and write data to and from a tag and to perform identification functions. The tags are usually mounted on a pallet for logistics, production or other automation applications. The V690 series uses the license-free industrial, scientific and medical (ISM) spectrum to transfer the data, which offers a number of significant benefits over traditional RFID systems. The distance between the tag and head can be much as 5m and while line of sight communication is preferable it is not essential. This means that it may be possible for objects to come between the head and tag without affecting communications, although obstacles containing a high water content will cause attenuation of the microwaves, reducing communication distances. A communications test is available to check the reliability of transmissions. The high microwave transmission frequencies (around 2.45GHz), allow data transmission rates of 600kHz. Up to 8kbytes of data can be transferred in a single read or write operation. 8kbytes is also the data capacity of the tag. The head measures 280mm x 280mm x 60mm and has an integrated amplifier. It supports both read and write operations and outputs RS232 for direct connection to the external controller. A RS422 conversion link unit is available for systems requiring up to 32 heads. To save power, a low-power transmission mode is available when only 2m transmission distances are required. The controller also supports a number of other functions such as FIFO and multiple tag access. The tags measure 86mm x 54mm x 13.8mm and are IP67-rated, making them splashproof. This is necessary for applications such as food processing, where complete hose-downs following each change of shift are mandatory for sanitation. Tags come with a built-in lithium batteries. A power saving mode is available to save battery power and a voltage alarm will be generated when power is low.